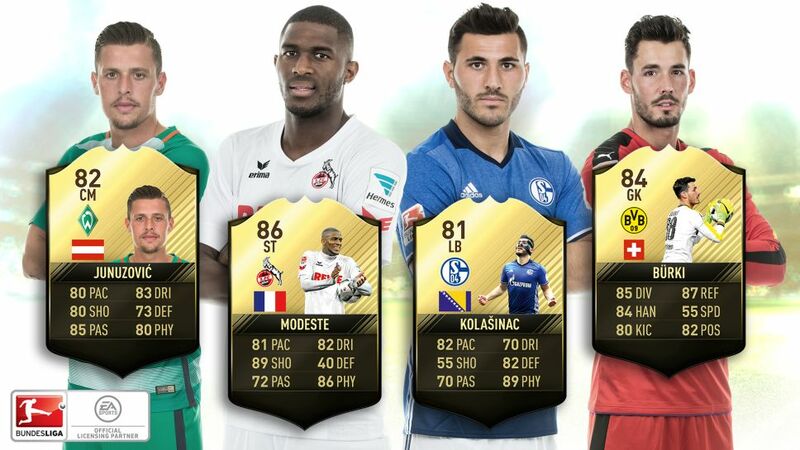 Four Bundesliga players have been named in the EA Sports FIFA Team of the Week for their outstanding Matchday 25 performances. Make the most of the international break to get your Official Fantasy Bundesliga team in order! Modeste moved onto 22 goals for the league season this weekend with a superb hat-trick against Hertha Berlin, and in doing so created a slice of Bundesliga history – never before had three players reached the 20-goal mark this early in the campaign. In joining Pierre-Emerick Aubameyang (23) and Robert Lewandowski (21), the Frenchman proved that he has what it takes to succeed on the big stage, while teammate Timo Horn insisted that Modeste is outperforming his illustrious rivals. The 28-year-old inspired Cologne to a 4-2 win, which saw them snap a five-game winless streak and stay in the hunt for Europe. Kolasinac rifled in the only goal of the game as Schalke got the better of Mainz on Sunday, and boosted their European hopes with just a second away victory of the campaign. The Bosnian's contribution wasn't limited to his winner, though, as he pulled the strings for the Royal Blues in midfield with the highest number of touches (86) and completed passes (37). His third goal of the season – after a fine one-two with Guido Burgstaller – enabled Schalke to make it back-to-back wins, and sees them pull to within just four points of the Europa League places. The Swiss keeper had two big hands in Dortmund's narrow win over Ingolstadt in the Matchday 25 opener, making superb stops to deny Mathew Leckie and Sonny Kittel before half-time. In spite of Aubameyang's early goal, BVB continued to soak up pressure at the SIGNAL IDUNA PARK, with Ingolstadt managing more shots on goal (14) than their hosts (10). Bürki kept Die Schanzer at bay though, earning himself a seventh clean sheet of the season and helping third-placed Dortmund close the gap on RB Leipzig. Junuzovic may only have made the EA Sport Team of the Week bench, but he still played a vital role in Werder Bremen's remarkable dismantling of second-placed Leipzig. The Austrian international set the Green-Whites on their way to a fourth win in five Bundesliga outings with a terrific opener – a 25-yard half-volley that has just been voted the Matchday 25 Goal of the Week. He went on to tee up Florian Grillitsch's second goal, and also covered the most ground (11.98km) as it finished 3-0. With Junuzovic in this kind of form, Bremen could find themselves making an unlikely push for Europe rather than remaining mired in the relegation scrap. Find out who joined our awesome foursome in the Matchday 25 Team of the Week!